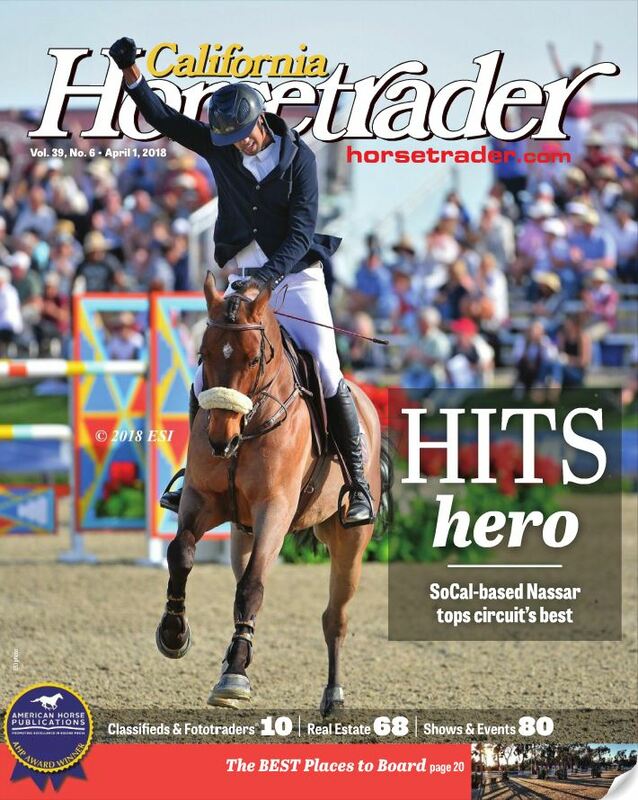 THERMAL — The dust has settled from an ambitious 2018 HITS Desert Circuit, and the pinnacle prizes once again were pinned on Nayel Nassar, the 27-year-old Southern California-based rider who represents Egypt. 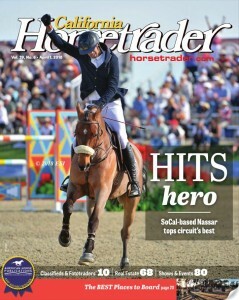 Riding the 14-year-old Hannoverian Lordan, Nassar won HITS Coachella’s prestigious pair — the Longines $100,000 FEI on Feb. 11, and the AIG $1 Million Grand Prix March 18 — in a prodigious sweep for the record books. In the AIG $1 Million, Nassar earned $350,000 for the win. Rowan Willis settled for runner-up with the 12-year-old Blue Movie, and in third was Paul O’Shea with Skara Glen’s Presence. The top five was rounded out by Christian Heineking on NKH Caruso in fourth and Erynn Ballard with Fantast in fifth. 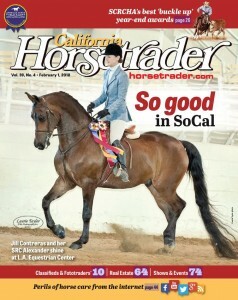 BURBANK — It’s the time of year when hopes are high and anticipation for the show season rises. For many Arabian and Half-Arabian competitors, it’s also the doorstep to the venerable Scottdale Arabian Show,so any schooling in a live arena is golden. The Southern California Half-Arabian Association and the Arabian Horse Association of the San Fernando Valley conducted a golden opportunity Jan. 19-21 for both clubs’ members to meet whatever January objectives they have. The dual-qualifying show for Region 1 and Region 2 attracted a variety of barns from throughout the state, including several keen on this month’s 63rd Annual Scottsdale showdown Feb. 15-25. The Los Angeles Equestrian Center was buzzing with classes that included sport hroses, dressage, youth, amateur, trail, western dressage, and ranch horse pleasure. Special awards were issued for High Point Dressage Horse and High Score SPort Horse,and in addition to the previously mentioned regions, the event was a qualifying show for Pacific Slopes and the U.S.,Canadian and Sport Horse Nationals with AHA, USEF and USDF approvals. BURBANK — The California Reining Horse Associations capped off its 2017 year with good competition and good times, as competitors brought the Los Angeles Equestrian Center to life for its year-end Challenge show and the National Reining Horse Association Affiliate Qualifier. 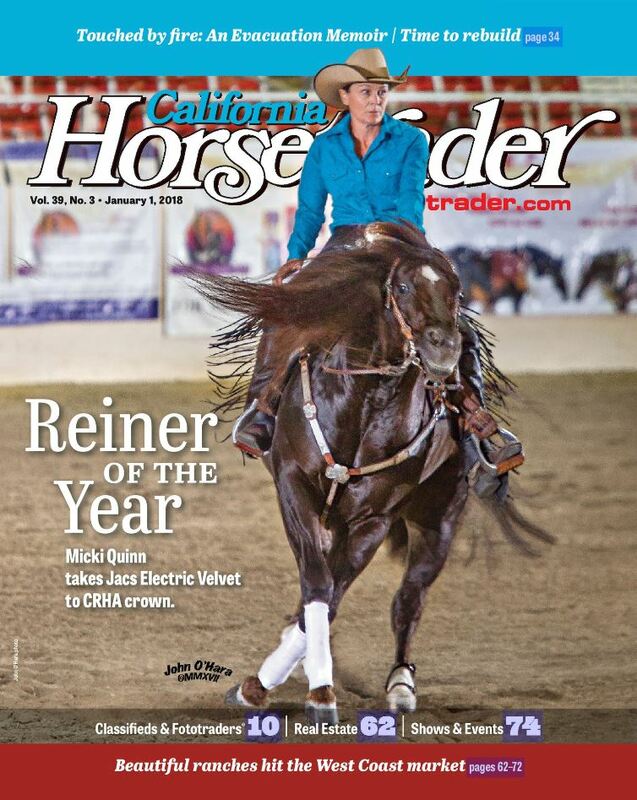 One of the association’s great fall traditions is the CRHA Reiner of the Year, and the 2017 winner, Micki Quinn, had quite a show. Riding her Jacs Electric Velvet, Quinn brought home hardware after winning the Non Pro, Limited Non Pro, Maturity classes, and she also got to take home the Becca Goss Memorial Foundation trophy, Gatolotto Memorial buckle, Topsail Cody Memorial trophy — and a hrose trailer from All American Trailer. That is your 2017 CRHA Reiner of the Year! A new CRHA award, the Rick Flathers Sportsmanship Award, was presented this year to trainer Penni Gerardi of Agoura Hills. The award honors a person who has distinguished herself or himself by demonstrating acts of sportsmanship and ethical behavior. Donated by his friends and family, the award memorializes a favorite colleague who passed March 7, 2016, on the trail behind his home in Orange Park Acres following an accident on horseback. 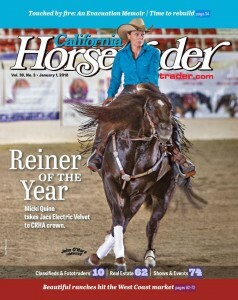 The award was presented by Nancy Flathers, whom Rick met in 1972 at the El Toro Stables in Orange County and later married. The couple were supportive, positive, and generous members of the CRHA, and along with his wife, Rick was an early club member and an enthusiastic presence at the CRHA shows. Rick was always encouraging not only to his wife, who was an avid competitor and successful Non Pro, but to his barnmates, fellow showmen and peers, setting an example of sportsmanship and goodwill that was infectious. A member of the CRHA since its inception, Rick was not only a financial supporter, but was also happy to give his time to the CRHA Board of Directors for several years, adding value not only as a competitor, but as a businessman, helping to shape what would ultimately become the flourishing association that CRHA is today. 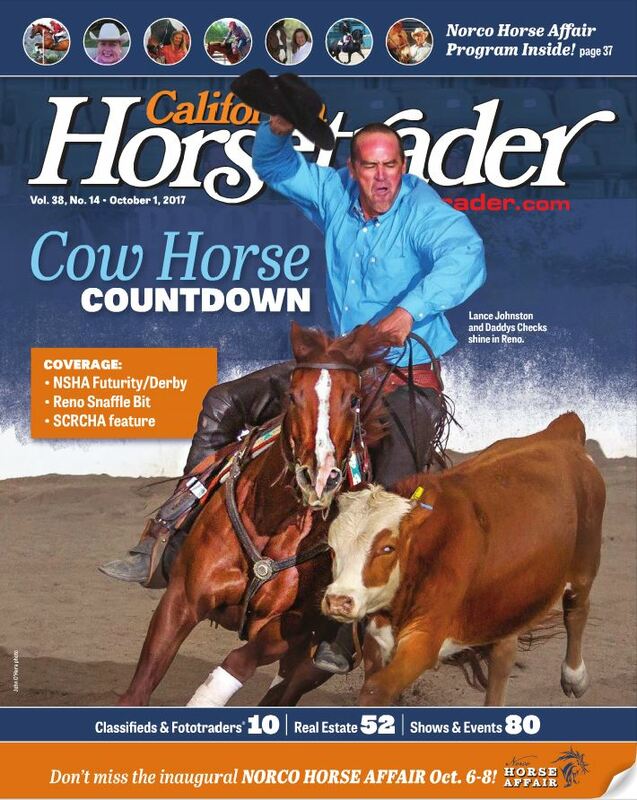 The cow horse world lost a legend in late 2016 when Benny Guitron passed away, and on Jan. 29 it came together for a heartfelt celebration of life for the Merced-based trainer. More than 400 friends and family attended the memorial hosted by Loren Booth in Minkler. 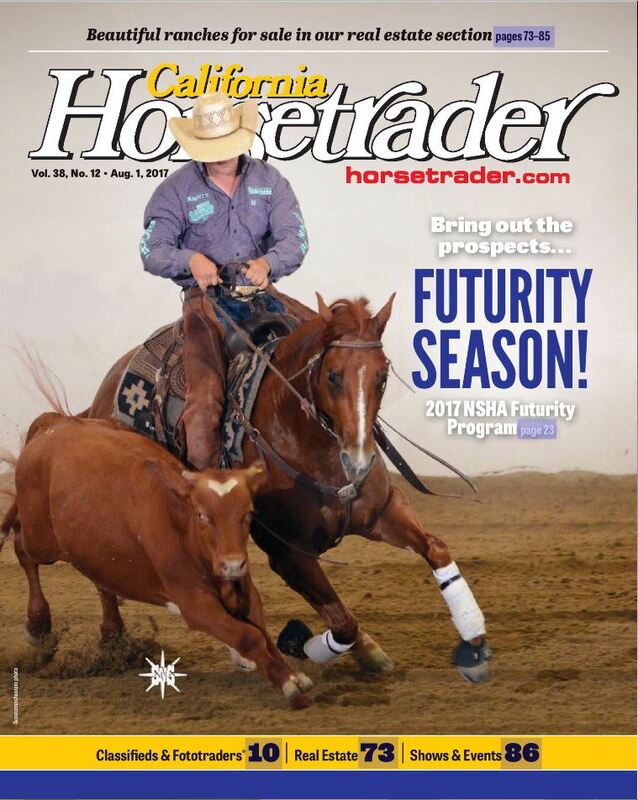 Benny, a National Reined Cow Horse Hall of Famer and the 1976 NRCHA Snaffle Bit Futurity Open Champion, had died the previous month from complications in his battle against cancer. 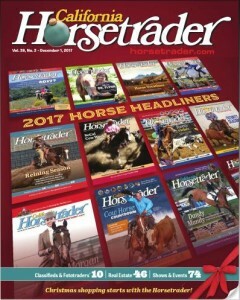 Great news came out of the Los Angeles Equestrian Center on Jan. 26 when it announced that the California Department of Food and Agriculture released the LAEC from all quarantine, ending an episode of horse health concern that had begun two months earlier with confirmed cases of the EHV-1 virus. Dr. Katie Flynn, California’s State Regulatory Veterinarian, applauded LAEC’s management, staff, horse owners and trainers for their diligence and teamwork in the situation. 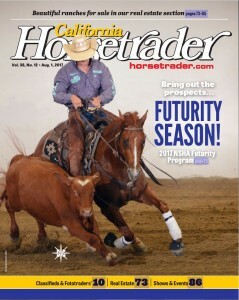 With 725 horses on the property, a large show facility and public trails, the challenge was large and immediate. “Their responsiveness to regulatory recommendations truly demonstrated that they had horse health and the best interest of the horse as their priorities,” said Dr. Flynn. Larry Langer, a part of the horse industry for 66 years — from starting lessons as a child to his induction into the Show Jumping Hall of Fame — was honored in January for his devotion to equestrian sport with the Lifetime Achievement Award. 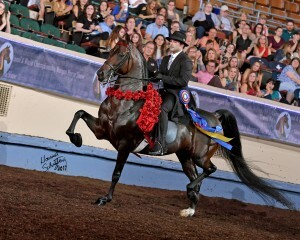 Eric Antman and Merriehill’s After Hours, owned by Theodore and Elaine Olsen, proved again this year to be at the top of the Morgan breed with multiple titles. OKLAHOMA CITY, Okla. — The best of the best in the Morgan breed was celebrated at the 2017 Grand National & World Championship Morgan Horse Show, held Oct. 7-14. Since 1973, this show has represented the pinnacle of achievement in the Morgan horse world, and this year more than 1,000 of the world’s finest Morgan horses from across the U.S. and Canada met to compete in over 300 classes for $400,000-plus in prize money. 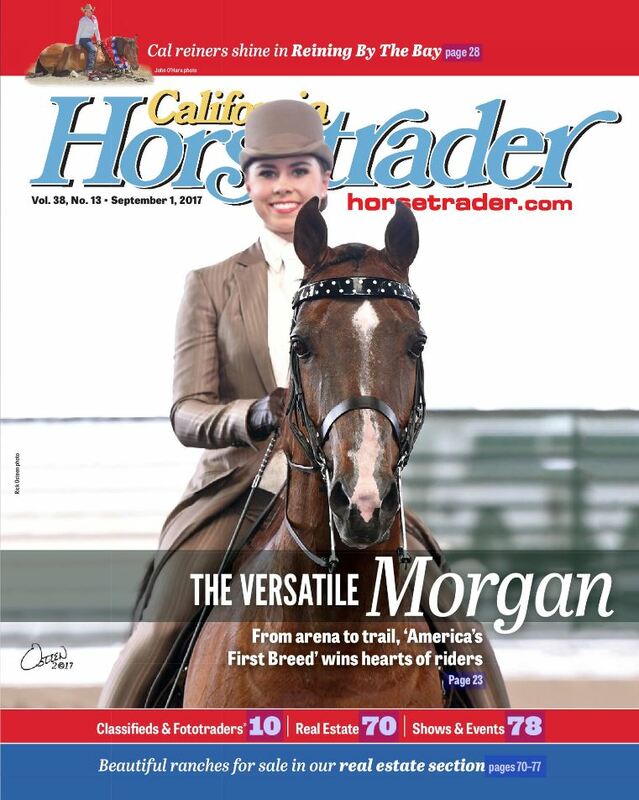 Several West Coast Morgan stables were extremely successful, bringing home multiple World Grand Championships and Grand Championships. Kate Ramsower of Alamo, won the highly competitive AMHA Youth of the Year Award after competing with other youth from all over the nation in four different areas, including written exams, oral presentation, judging contest, and horsemanship pattern. She is trained and instructed by Merin Maggi at Maggi Stables in San Martin. RENO, Nev. — Reymagedon and Zane Davis were crowned the Open Futurity champions, and George Booney and Cori Shields made a clean sweep of the three Non Pro Futurity division championship titles at the inaugural Reno Snaffle Bit Futurity, presented by Lucas Oil and Protect The Harvest. The West Coast tradition of the reined cow horse sport continued Sept. 11-17 at the Reno-Sparks Livestock Event Center. As the Open Futurity Champions, Davis, of Shelley, Idaho, and Reymagedon (Dual Rey X Savannah Hickory) won a $30,000 purse with a composite score of 658 (214 herd, 218 rein work, 226 fence), plus a saddle and breast collar made by Scottsdale Western, a buckle made by Skyline-Vaquero, a Custom Don Dodge Snaffle Bit donated by Greg Darnall Bits & Spurs, and Platinum Performance supplements and Lucas Oil Fast & Easy Detailing Kit. In 1789, George Washington became the first president of the United States and the U.S. Constitution was signed into law. That same year in Springfield, Mass., a small bay colt named Figure was born. This colt was instrumental in building the new country and founded America’s original equine breed, the Morgan. The Morgan, the first recognized horse breed in the U.S., is the official state animal of both Vermont and Massachusetts. Other breeds have claimed existence in colonial times, but only the Morgan can trace its bloodlines to a common ancestor. The Morgan has influenced other breeds, including Tennessee Walking Horses, Quarter Horses, Standardbred, and American Saddlebreds. 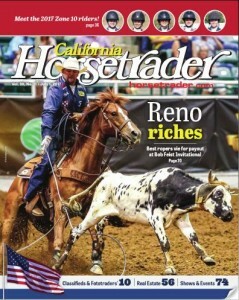 RENO, Nev. — Middle America should be proud of the cowboys it sent to Nevada for the richest one-day team roping in the world. The 40th anniversary of the oldest, most prestigious invitational team roping in the sport paid out $800,000 in cash and prizes Monday over six rounds of fierce competition. Founded by Bob Feist in 1977 to showcase and reward the world’s best professional team ropers, the event today is owned by Ullman-Peterson Events. 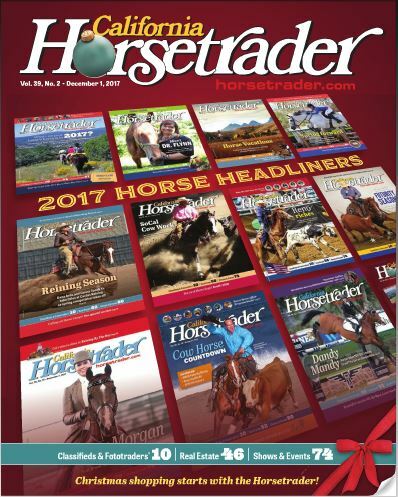 Annually they invite the top 100 teams in the sport to the Livestock Events Center, where they compete in six rounds for a cash-and-awards package worth more than $800,000.